By volunteering with Serve Jersey city, residents can expand their skills and experience while meeting new people who share the same interests. Volunteering provides a great way to expand your professional and personal growth while contributing to your community. 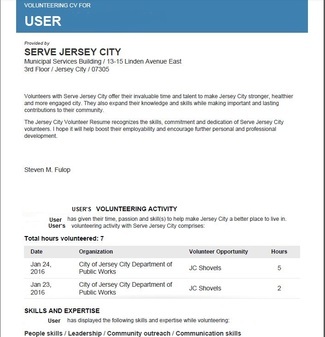 When you volunteer through Serve Jersey City, you are able to create a volunteer CV (curriculum vitae) that is endorsed by Mayor Steven M. Fulop. Use this resume to impress prospective employers, colleges, and more. This customized volunteer CV includes the organization name, details on the volunteer opportunity, skills demonstrated, and a reference from the volunteer manager. 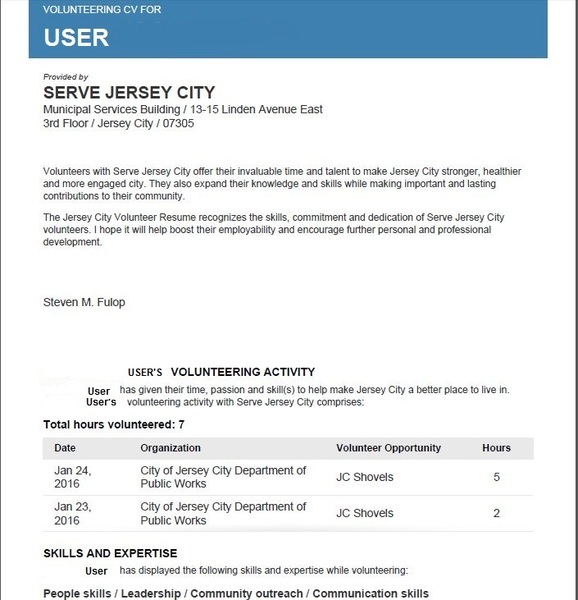 Register with Serve Jersey City by creating a profile here: http://volunteer.jerseycitynj.gov/register. Under the Volunteers tab, click on Find an Opportunity. Once you have registered for the volunteer opportunity and completed your hours, log your hours through the Log Volunteer Hours tab. Once the organization approves the volunteer hours, you will be able to generate your volunteer CV. You may download it as a PDF. Use your resume for job or college applications!